Growing up, we moved a lot. Like, approximately every two-and-half to four years. Downside: I was always the new girl. Upside: My family is expert at packing. Since my marriage a little over five years ago, we have moved five times. We’ve done both inter- and intra-city moves. I’ve experienced the stress of having to getting everything into boxes because the moving truck is coming right now and they aren’t going to wait. I’ve felt the drain of shlepping a seemingly never ending number of car loads to a new abode less than a mile away. They’re both pretty stressful, just different variations. Like childbirth, I kind of forgot just how painful moving could be. So when it turned out that we would be moving this July (on the 18th), I was like, NBD. Let’s do this. We had the good fortune to get the keys to the house and still have about a month and a half before our lease expired. While this meant that we had a month where we paid both rent and a mortgage payment (ouch), it was better than the other two options of having to pack and move everything in 17 days or having to pay both rent and mortgage for two months. Having that extra time to move was really helpful, but it kind of lulled me into a false sense of security. Yeah, I knew deep down somewhere that things would probably get hairy as the moving date approached, but I thought, “hey, I can always just get an epidural, right?” No, no, I just didn’t really think that. I just didn’t really think about how stressful it would get. At first, it was easy peasy. I started packing our books into all the diaper and wipes boxes we had around (they have handles and they are the perfect size for books, ’cause they don’t get too heavy. See? That’s the experience of a perpetual mover right there). Moving books is one of the easiest things. They fit nicely into the boxes, you know they’re going on a bookshelf somewhere, they don’t talk back. Ah, if only the whole move could be like moving books. I tried to take at least one trip per day over to the new house, bringing over the random stuff we weren’t using at the time, a lot of which was already stored in Rubbermaid containers. 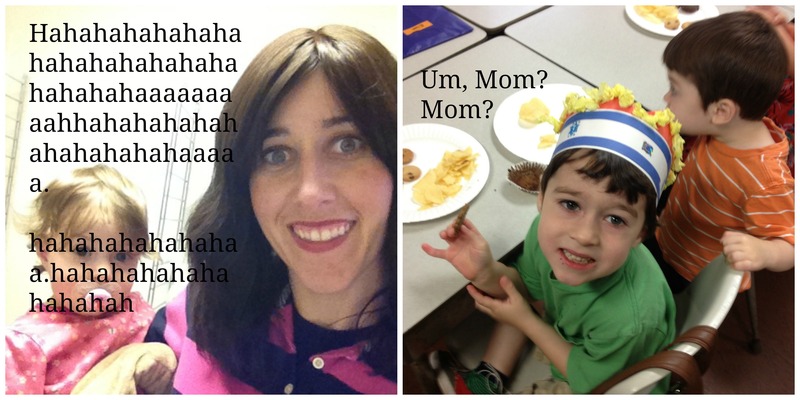 Our Pesach supplies, our Purim costumes, my maternity clothes, the boys’ baby clothes. Anything not currently being used was packed up and brought over. The kids loved going over to the new house. They wanted to go over at least twice a day (I didn’t give in to that particular desire, though I was happy that they were excited). We would go over and have early dinner in the kitchen nook, which is one of my favorite things about the house. Apartment = no stairs, house = stairs. The baby became obsessed with going up the stairs. However, she had not quite grasped the concept of going down stairs safely. She would get to the top, survey her conquest of the summit proudly, then take a brave step into . . . nothingness. It was like a team-buildling exercise that only she was participating in. “Time for the trust fall, Mom!” she might have been saying to herself. We had gates at the apartment, but due to the shape of the staircase (which I love), none of my gates really fit on it, so I had to improvise and pile a bunch of containers in front of the stairs. That’s my liberal arts and sciences degree being put to good use, right there. This means that the boys could no longer run around upstairs, much to their disappointment. Well, we’re teaching them about the realities of life over here. Our beautiful hardwood floors still had the carpet tack around the perimeter of the living and dining room. It was like a forest of inverted nails. I could warn the boys not to touch the sharp, minuscule yet extremely hazardous edges of the rooms, but, again, the baby. So I brought over the portable crib, some toys, and the doorway jumper seat. I thought it was pretty clever. I would go over with the baby (or the baby and my younger son), and she would entertain herself while I brought in boxes from the car. As you can probably guess, that is not what happened. What happened was that I put her in the portable crib and she started screaming hysterically whenever I went out the front door. There was no toy interesting enough to counter the fear of being left in an unfamiliar place. I should’ve realized that. Poor baby! After that realization, I only moved things over at night when my husband was home to watch the kids. Theoretically, that might have worked, but I’m usually exhausted by the end of the day, so having to move on top of the fatigue was challenging. The wilderness which is our backyard. 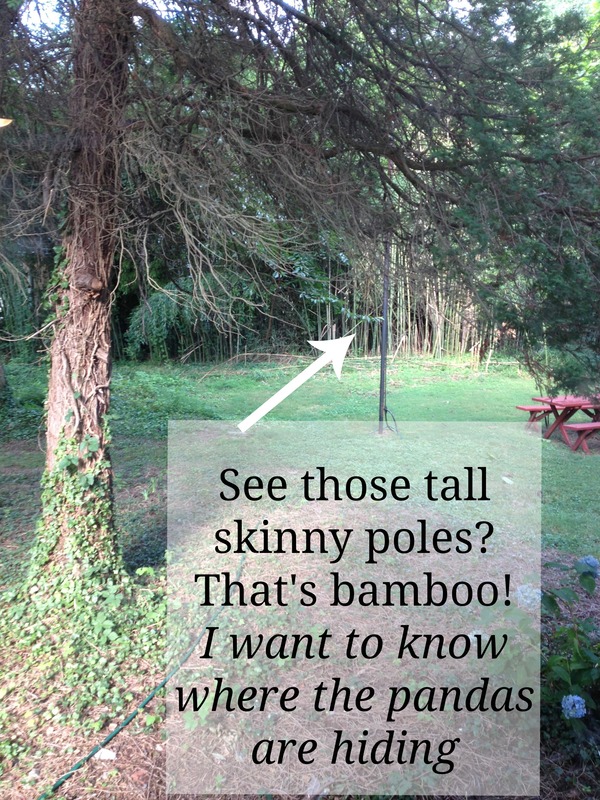 Did you know that bamboo grows in Baltimore? It does, and I think most of it is in our backyard. It’s kind of amazing, really, except when we had the lawn people come and cut some of it down. They cut them so that there were pointy shards sticking up about two feet out of the ground. Yeah, that’s really safe for children, especially small boys who like to run around. Really safe. We had them come back and fix that, btw. Also, there’s an ivy-filled area which looks like it was probably a fish pond or something at some point, but now is just an ivy-filled hole that I have not really explored yet. And there’s a lot of plant life back there, which is awesome, except how do I know what’s poison? The basement door that didn’t fully close, again with the stairs (thankfully, that’s been resolved). The amazing wraparound porch that the baby kept trying to fall off. And again. The swarm of mosquitos and various other unidentified yet biting bugs. Things got a little zany. The Shabbos before we moved, I realized that I had somehow moved all the coffee to the new house (I have no idea how that could have happened. It’s inexplicable), and I also forgot to plug in the hot water urn, so I couldn’t even drink hot water. Thankfully, everything really did go well, and we made sure to give the movers lots and lots of water (on top of the water they brought for themselves), and we are now happily, hectically in our new home. Now I just have to unpack. Oy. Previous Post DVDs for Children – Boon or Bane? Mazal tov on your new home and successful move. Good luck with the unpacking!! Thanks! I sense many, many unpacking posts in the future. It’s going to take me forever! As a mom of five sons, I could relate. We moved around the corner from our previous house when the youngest was 2 1/2 and I still remember the hysteria. I love your writing style and sense of humor. By the way, never mind those gorgeous hard wood floors; I love that bannister! Great house. Have lots of mazel in it. Soo funny, Rivki! Hilarious. 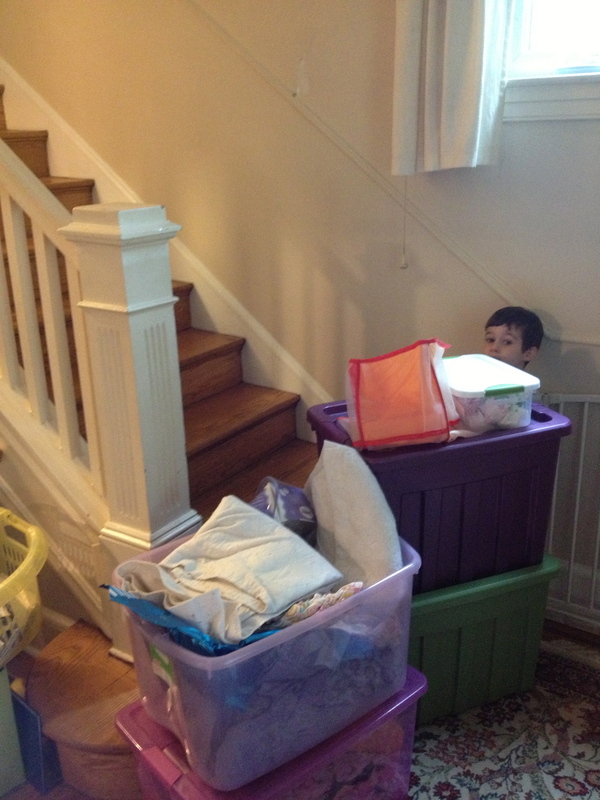 I remember us moving to our new house when my first two were 1 1/2 and 3 – both extremely active and without any sense of danger (stairs, tools…) it was exhausting. Anyway, masel tov to your new home! The garden looks lovely! You would think they would have some sort of self-preservation instinct or something, right? Thanks for the kind wishes! Enjoyed this whole post, but the best part was definitely the pointy tools in the fireplace. So wonderfully relatable…gotta love the pointy tools. Pointy tools: Every little boy’s dream; every mother’s nightmare. Mazal Tov on your new home. I relate a little. We also have nails sticking out in an area in our house. (except we’ve been here for one year already…) Looks beautiful! Funny post. Thanks! It’s amazing what you can adapt to over time. I can already feel the urgency to unpack receding into the background as I go along my daily routine…. Thank you! I know, I’m master at the timing. Master. Really, it was because my dad was already in town for the move, and he could stay a little to help with the recovery. I’m a fan of just pulling the band-aid off fast. Also, you can tell the move has addled me a little because I just used the word “totally” twice within ten words. In my defense, I *was* born in Orange County, CA. True story. Don’t ask me how many times I’ve moved – after age eight it’s all just a blur. It seems like it’s just part of life for some of us. I can’t really imagine being in the same place for very long! We’ll see how it goes. MAZEL TOV. Wow, you JUST moved to a whole other city and now you’ve moved again. I’m impressed! Can I borrow you to pack for my move?! I am moving to an apartment a mile away from shul so I can actually stay at home and have my own Shabbat guests! Super excited to live there, just not excited for the move. 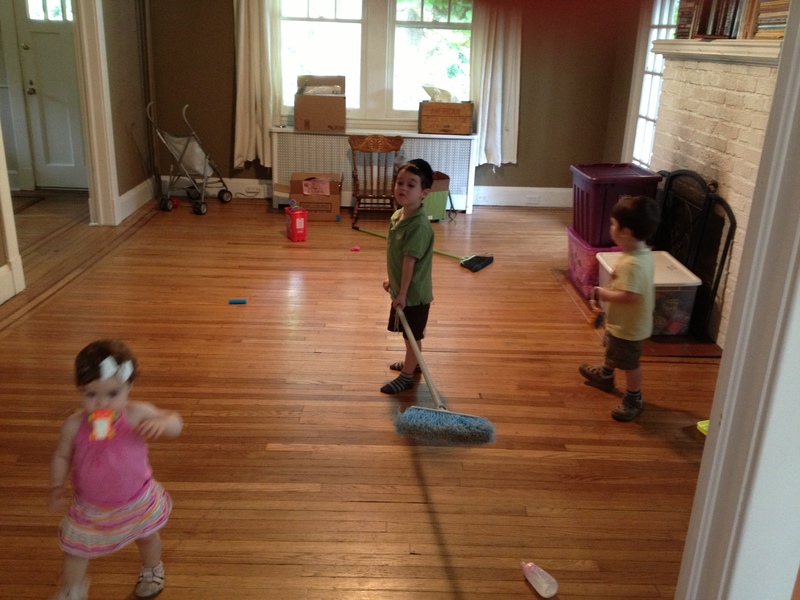 Mazal tov on getting everything moved over to the new place, and on the new place! Hoping the unpacking goes smoothly. That sounds like a nice location! I feel your pain for the moving part. Good luck! Mazal tov on the house! Oh how i hate moving! But like you I have it down to science. Also like you I have a bunch of children who nullify all my attempts at organization. What can ya do? Do u want to come next week? Send me a message. My dream is to move to a house with a backyard, I am so tired of apartment living. We’re very happy with the house, and I definitely understand what you mean about apartment living. I hope you get your backyard dream fulfilled! Twice in four months is brutal! I would’ve been grumpy, too. The excitement of potential is a lovely thing. Enjoy it! Oh! I love this so much! I was laughing so much and then really laughed when I imagined your maniacal laugh. ;) (With you not AT you!) Love the high tech gate. Welcome to your new home! May you fill with much naches! Oh man, I know we need to find a solution to that bamboo situation.